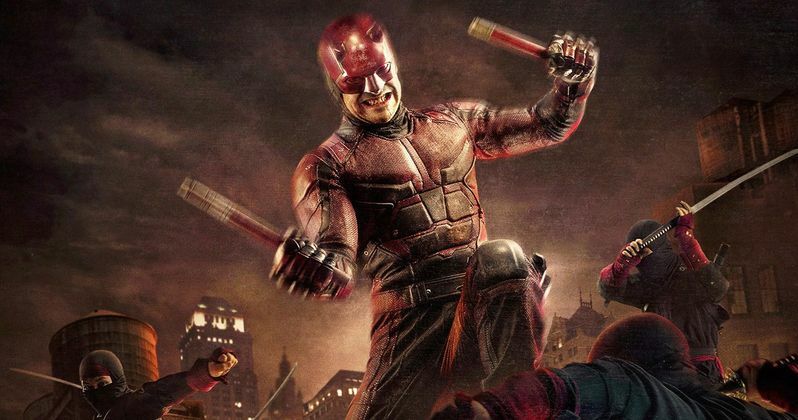 Netflix's Daredevil TV show is without a doubt one of the most groundbreaking shows to ever grace the small screen. With it's layered characters, action scenes filled with gruesome violence, and intriguing story lines, there really isn't anything like it on TV. With two seasons under its belt, it seems a no brainer that there will be a Season 3. Or, will there? As everybody knows, The Defenders, coming to us via Netflix and Marvel, is shooting at the end of 2016. This features the characters of Daredevil (Charlie Cox), Jessica Jones (Krysten Ritter), Luke Cage (Mike Colter) and Iron Fist (Finn Jones) as they team up to battle various forms of injustice. For us Netflixers, this is pretty darn awesome. We're going to be essentially getting a 13 hour movie with all of these diverse characters. At the same time, because of The Defenders, one has to wonder why Netflix and Marvel would continue to spin their wheels with separate shows for all these characters? Sure, it would probably be a content cash cow. And yes, there's plenty to draw from story wise. However, there is only a finite amount of cash, and it might not make much business sense to move forward with stand alone shows after the characters join forces. Nothing is etched in stone, however. There is still the possibility of a Daredevil Season 3. With all the unresolved plot points, it doesn't seem like they could all be dealt with in The Defenders show. There are too many characters with their own issues (and in the case of Jessica Jones and Luke Cage, issues with each other), that it would make resolving or even exploring Daredevil's issues next to impossible. So, if there is going to be a third season (and we sure hope to hades there is!) there are some things we would like to see. Things that should be illuminated if for no other reason than they underscore just how Daredevil (and Netflix and Marvel) broke every rule in the realm of TV. What we bring you are these thing we hope we see in Daredevil season 3. At the end of the second season we saw Elektra being lowered into the earth. She was ensconced in a stone coffin and one can't help imagining that this final scene ultimately foreshadows her return as Black Sky. As she was in the clutches of The Hand, the group Daredevil (and Elektra) were previously battling, it seems safe to assume that she will come back and now be something (or someone) that Daredevil no longer knows and is giving him an even bigger headache. What does this mean? Once again the viewers win because chances are they will go head to head in a confrontation that will be nothing short of astounding. This, or something like it, really needs to be the lynchpin of a potential third season. Jon Bernthal came on the screen as the Punisher and just about stole the show from everybody he shared it with. This is no small feat considering he was going up against one of America's greatest actors in Vincent D'Onofrio (Kingpin), as well as a cast of truly solid thespians. Now, it's been said, by Bernthal himself, that the character he played on Season Two of Daredevil was not the Punisher as we know him. The Punisher is out for justice and believes that he can use the law to achieve that. Whoever it was that we saw in Daredevil doesn't believe in anything. He is hellbent on getting satisfaction at any cost. Well, whichever version shows up, lets please have a lot of them in Season 3 (even though we know he's getting his own Netflix series). Daredevil truly seemed at his breaking point dealing with Elektra, Stick, the Hand and his plummeting law practice. Frank Castle was a thorn in his side that not only wouldn't go away, he insisted on wedging himself deeper and deeper into Matt Murdock's life. We need a lot more of this (and maybe a little less of the other distractions) if there is indeed a third go round. Perhaps they actually work together for a change? This just seems like a no brainer. The chemistry between Matt Murdock and Foggy Nelson is truly something special. While I am fairly certain that these two will rejoin forces, it would be awesome if it could happen in a way that is on a level playing field relationship-wise. Matt Murdock wanted nothing more than to protect his friends, and spare them any needless suffering. How about Foggy having Matt's back for a change? Once these two make nice it would be great to see them work together and be successful both fighting crime and litigating against it in court. Note to the show runners, have it happen smartly and preferably in the first few episodes of season three. If it has to happen later perhaps an interesting subplot could be Foggy prosecuting Matt in some way? Then through that they once again team up.